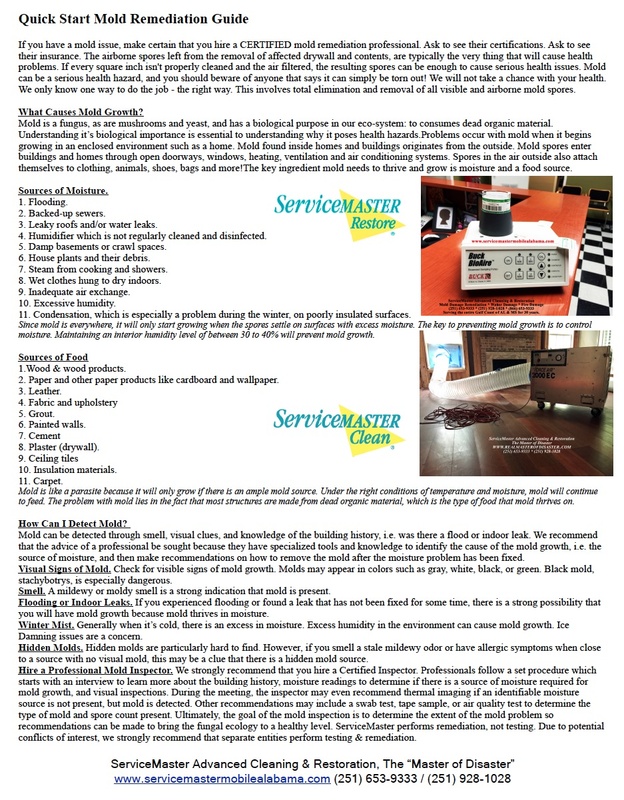 ServiceMaster Mobile, Alabama locally known as ServiceMaster Advanced Cleaning & Restoration, The Master of Disaster, has posted several guidelines about mold identification and mold remediation on their site. 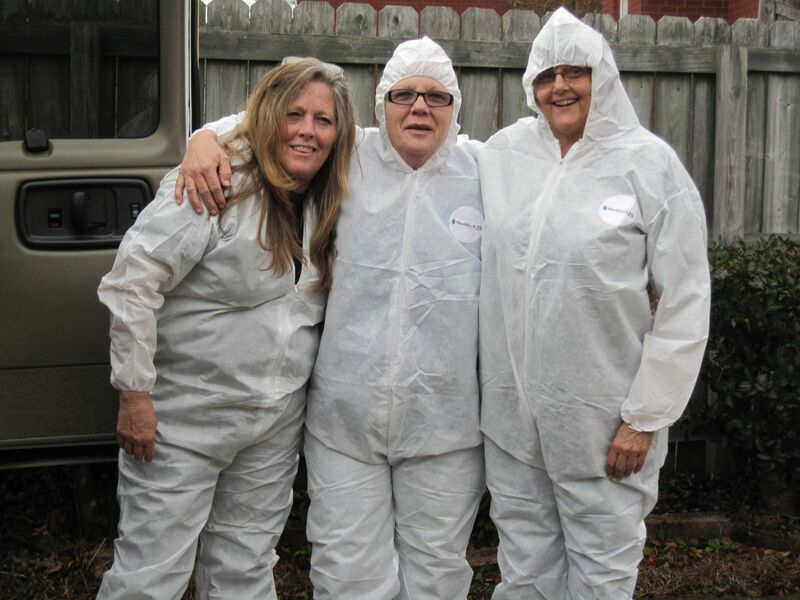 If you have a mold issue, make certain that you hire a CERTIFIED mold remediation professional. Ask to see their certifications. Ask to see their insurance. Mold can be a serious health hazard, and you shouldn't take a chance with anyone that says it can simply be torn out! The airborne spores left from the removal of affected drywall and contents, are typically the very thing that will cause health problems. If every square inch isn't properly cleaned and the air filtered, the resulting spores can be enough to cause serious health issues. We will not take a chance with your health. We only know one way to do the job - the right way. This involves total elimination and removal of all visible and airborne mold spores. 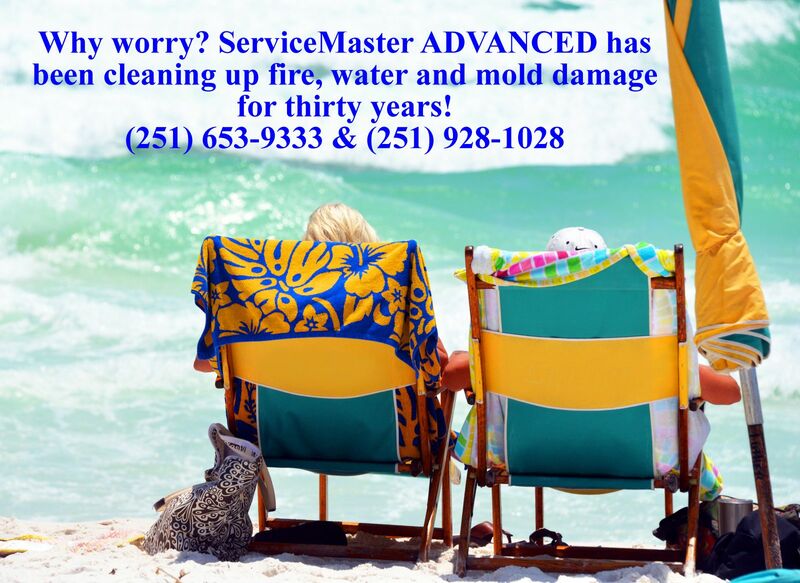 - ServiceMaster Advanced - The Master of Disaster (251) 653-9333, (251) 928-1028 & (866) 653-9333. You’ve had water damage in your house due to a burst pipe, a roof leak or a heavy summer storm. You hope that your insurance will cover the damage. What to do? First, read about mold below. You may not know the implications of water and mold damage. What Is Mold, and Why Should You Care? A food supply, which means anything organic such as books, carpets, clothing, wood, drywall, etc. The last condition, moisture, is the only practical factor to control in most houses. “ … mold … can cause … allergic reactions such as asthma or allergic rhinitis, non-allergic reactions such as headaches, and other symptoms [including] lung and breathing infections” (Health Canada, 2003). Dry Quickly to Avoid Mold! How did the water damage occur? Is this damage covered by your policy? Did the damage occur during the period your policy was in effect? Are you reporting the water damage promptly (within 24 hours) to allow quick drying and repairs? Hire a ServiceMaster Advanced Cleaning & Restoration to clean up the water and make repairs as needed to your house. Mold grows quickly; that is why you need us in your house promptly. ServiceMaster Advanced Cleaning & Restoration is certified and training in water damage restoration and mold remediation. Not only are we certified and trained, unlike many of the other "national" companies who advertise that they perform these services in Mobile and Baldwin Counties and the Gulf Coast, we actually perform this work here. All of our pictures and videos are of actual jobs that this entity actually performed here!​ We are experienced HERE on the Gulf Coast. Our pictures are not stock corporate photos provided to us by the franchisor, they are OUR pictures of jobs that we have done! 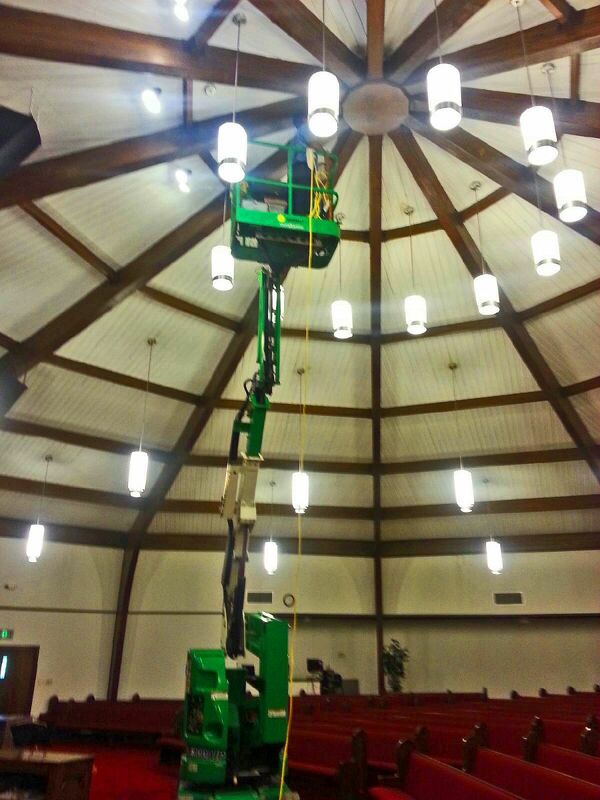 The above picture was done at a church in Eight Mile, AL where we were performing mold remediation. The affected area will be sealed off from the rest of your house. The workers will be wearing protective gear. There will need to be an exhaust fan removing air from the affected area to the outdoors. No chemical disinfectants, such as bleach, should be used during clean-up, only fragrance-free detergent. If transported through your house, moldy materials will be sealed in plastic. In areas where water may have seeped, such as wall cavities, basement subfloors, crawl spaces, etc. We have probably all encountered mold at one time or another. It might have been in the shower, or on a stale piece of bread or cheese/ There are many different species of mold, but all molds share some common characteristics. 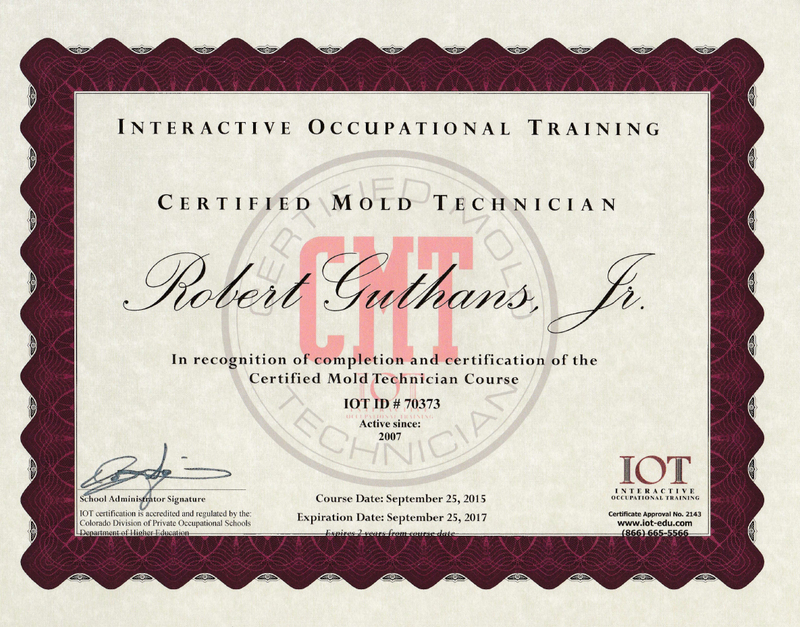 Molds thrive in moist and humid environments. Molds require an organic food source. One common food source is cellulose, which is found in building materials such as wood and drywall. Molds and spores are naturally present in the outdoor environment all around us. However, indoor mold growth can become a tenacious problem. Mold spreads rapidly and produces an unpleasant musty odor. If allowed to grow unchecked, mold can impact indoor air quality and can be difficult and costly to remove. Mold contamination is a growing concern for homeowners, property managers, insurance providers and restoration companies. 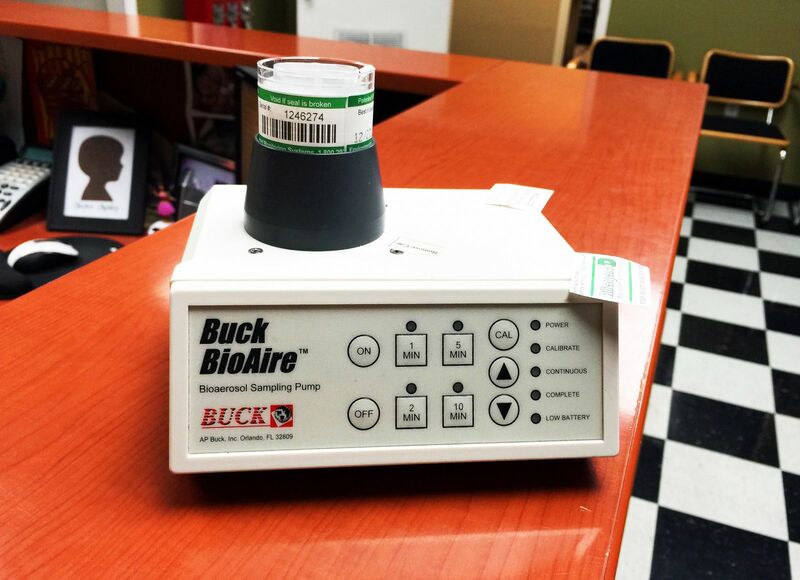 Below is a picture of air sampling actually being performed in one of our offices here in Mobile, Alabama. To learn, we made certain that our own environment was mold free! When a customer has a significant mold issue, we will typically recommend the services of an Industrial Hygienist. This person should be hired by the customer to pre-test for mold spore levels, write a remediation plan, and conduct post-testing spore counts. 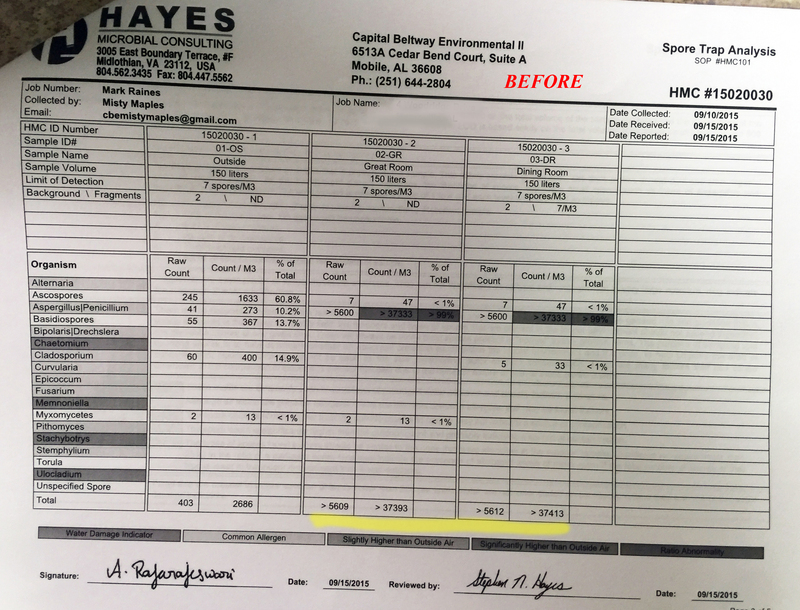 In the actual printouts from lab reports from an actual job that ServiceMaster Advanced performed, one can see the before and after results below. 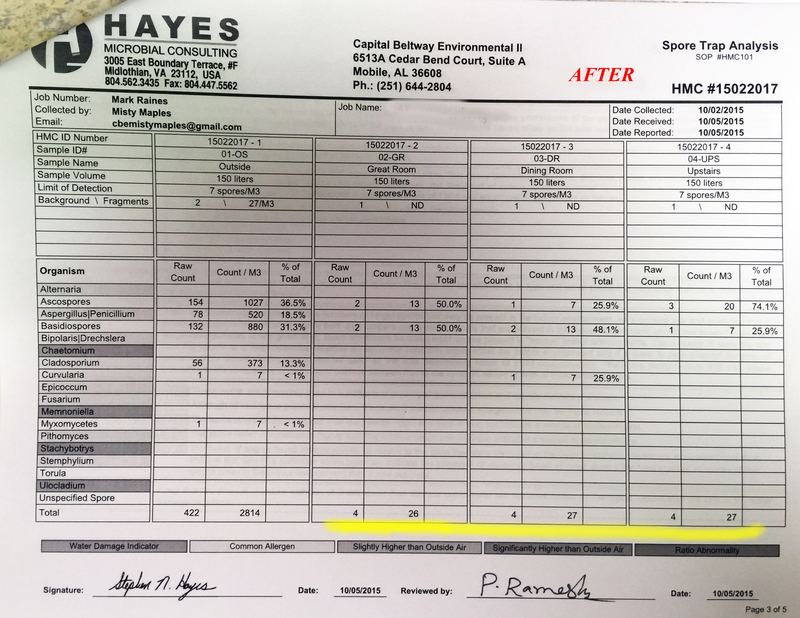 Note the "after" spore counts (highlighted in yellow), which are actually significantly lower than outside air quality! Mold can start to grow in as little as 48 hours. To prevent the spread of mold, it is important to react quickly in the event of a water loss. By identifying and eliminating the source of the water and implementing rapid drying processes, mold growth can be curtailed. The most effective drying techniques involve the use of sensitive tools to measure and record the temperature, humidity and moisture content of both the structure and contents of the home or building. Professional water damage restoration can mean the difference between a small water problem and a structure covered with mold. ServiceMaster Clean professionally trained technicians use the latest water restoration and drying techniques to deliver quality results. For 24 hour emergency service, call (251) 653-9333. 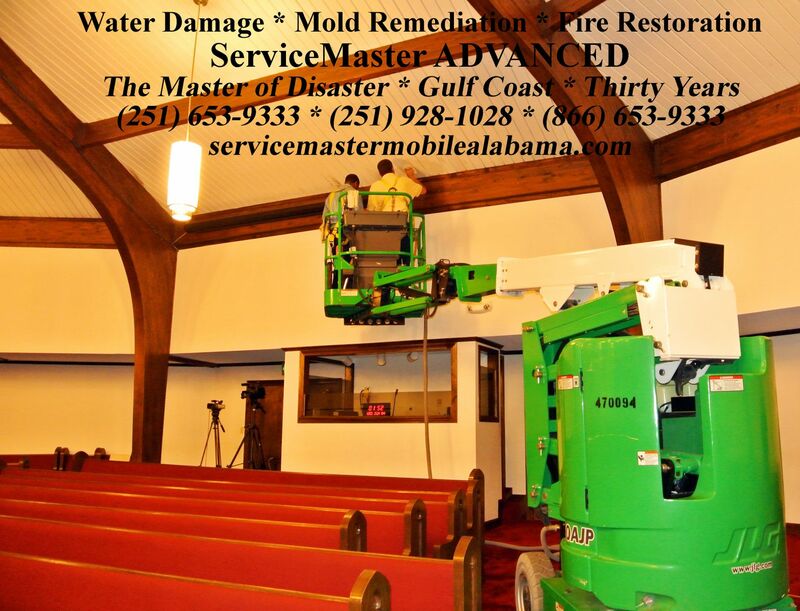 For more information about ServiceMaster Mobile, AL and ServiceMaster Advanced Cleaning & Restoration, disaster restoration services, visit www.servicemastermobilealabama.com. 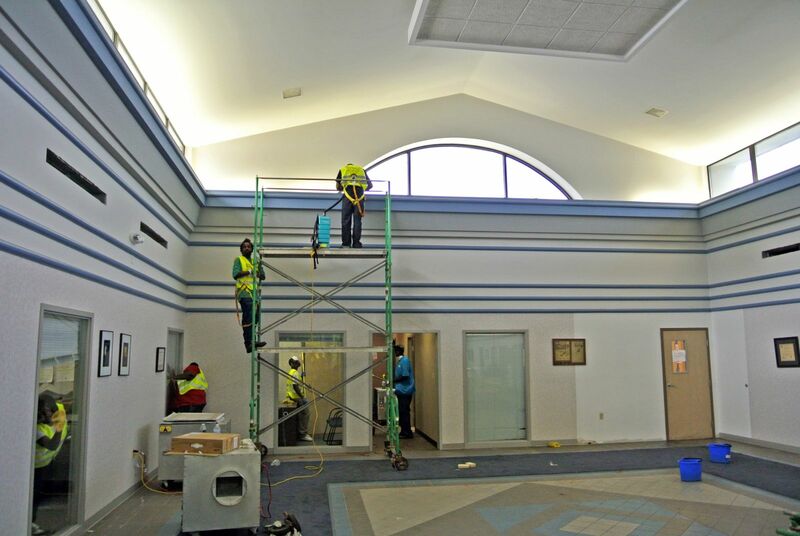 This article refers specifically and only to ServiceMaster ADVANCED Cleaning & Restoration. 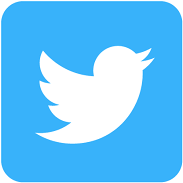 Make certain that you call this specific company as there are vast differences in capabilities between companies. We can be reached at (251) 653-9333, ServiceMaster ADVANCED, enterprise number 7027. If we observe mold, we will respond appropriately, immediately reporting our observations to the insurance company. When the extent of mold contamination is isolated and/or less than 10 square feet, expensive testing and protocols are generally not required. 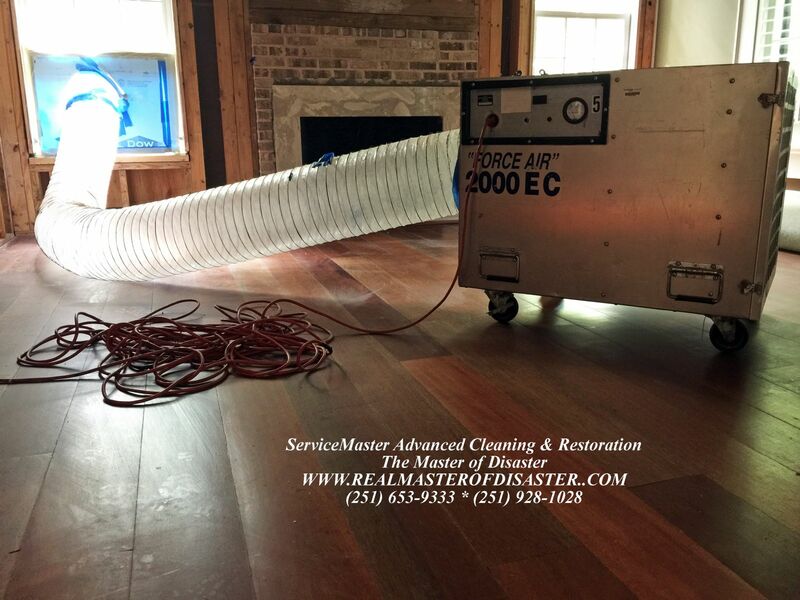 ServiceMaster Advanced can proceed with the claim and perform emergency water mitigation services, including remediation of the 10 square feet or less of mold. We will isolate the contaminated area and remove the mold, while protecting the surrounding areas from the possible spread of mold spores. 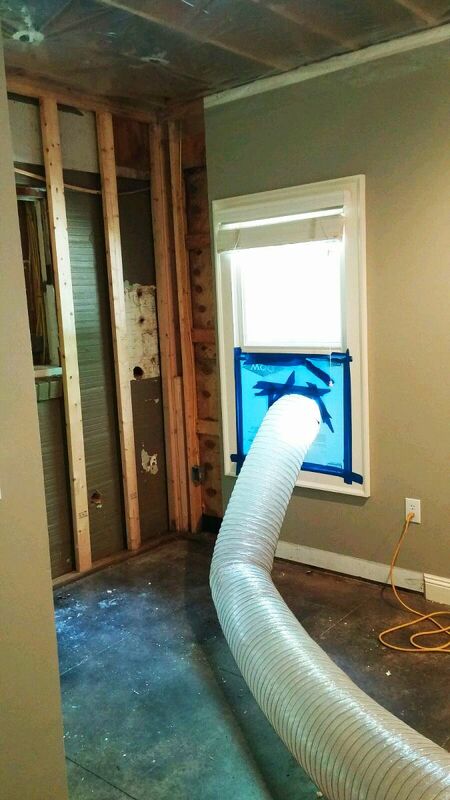 When we encounter an affected area of more than 10 square feet, we will contain the contaminated area, stop normal water mitigation procedures and immediately notify the insurance company, and notify the customer. In these cases, we strongly recommend the use of an environmental testing service to establish baseline levels of mold, identify the types of mold present and develop a written remediation plan. Our goal is to work with the insurance company to establish the proper procedures to handle the mold situation. 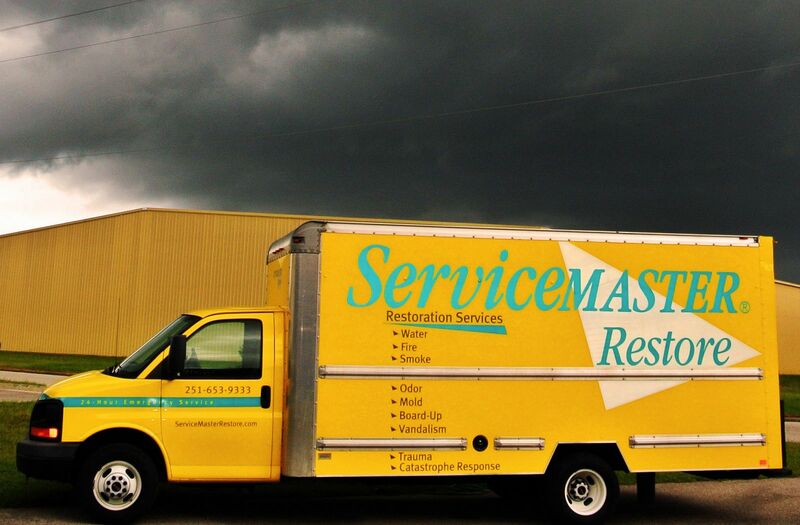 ServiceMaster Advanced, The Master of Disaster (251) 653-9333. http://www.servicemastermobilealabama.com. Printable mold remediation guide. Below. 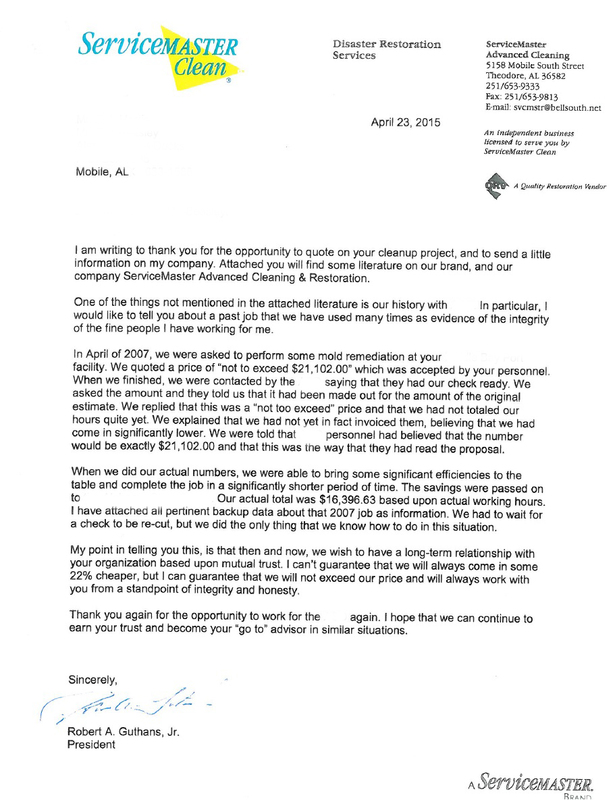 Below is a self-explanatory letter sent recently to one of our customers. Name withheld. We will always do the right and honest thing. Period.